Do You Store Flammables or Combustibles? Prior to storing flammable or combustible hazardous materials, it is necessary to evaluate the risks associated with each chemical being stored. Understanding possible hazards can be the key to avoiding a hazardous situation. Illustrated below are proper techniques to evaluating hazardous chemicals before storing. US Chemical Storage is dedicated to keeping you safe, secure and 100% compliant. Manage shelf life of chemical inventory. Do not stack chemical inventory. Secure your flammable storage locker. Install alarm systems (gas detectors, liquid level sensors). Keep aisles and exits clear for personnel. Label hazmat with proper use, disposal techniques, and dates. Install a fire suppression system. Keep work areas clutter free. Store oxidizing agents separately from flammables and other hazmat. Use proper temperature controls for volatile chemicals. Flammable storage locker by US Chemical Storage with mechanical ventilation, fire suppression and alarm systems. 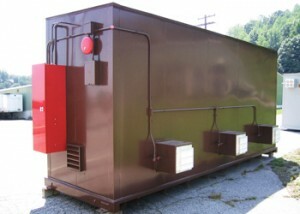 Store hazardous materials or hazardous waste materials safely with a flammable storage locker. The SUPERloc flammable storage locker by US Chemical Storage offers a 4-hour fire-rating for storing flammables and combustibles safely and compliantly. Designed by professional engineers and constructed by certified welders for superior strength and durability. The 4-hour fire-rated flammable storage locker by US Chemical Storage allows you to store your flammables or combustibles within or 10 feet from your facility. Storing inventory close or inside your facility provides a more efficient process for your operations. Built from heavy-gauge steel for maximum strength. All of our flammable storage lockers can be customized to meet specifics, tailored to your chemical storage requirements. Store large volumes or small volumes of hazardous materials compliantly. All of our flammable storage lockers feature a chemical and weather resistant paint to withstand extreme weather conditions and corrosive environments. Meets EPA, OSHA, NFPA and FM approvals or Warnock Hersey standards. US Chemical Storage is dedicated to keeping your personnel, investments and facilities safe, secure, and compliant.